Pharmaceutical powder blending presents challenges for high risk category products such as highly potent drugs, low dose drugs, drugs with narrow therapeutic indices (NTI), or drugs that have strong segregation or cohesion tendencies. Depending on the goals, applying PAT for pharmaceutical powder blending can help to achieve different levels of process understanding, such as real-time process monitoring and fault detection, process control strategies to ensure final product quality, or multivariate calibration model development and verification for real time testing and release, etc. 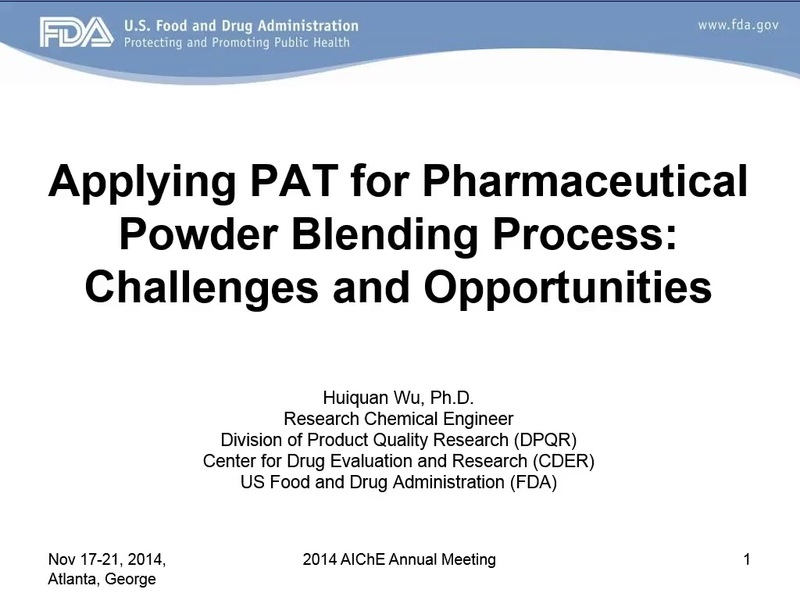 When applying PAT for pharmaceutical powder blending, certain unique challenges are to be addressed from a multi-disciplinary or integrated approach. For example, i) materials aspect: inherent heterogeneity of pure components or mixture; ii) sampling aspect: sampling strategy, sample size, and scale of scrutiny; iii) measurement aspect: experimental errors associated with sampling practice, dynamic process environment, dynamic measurement environment; and iv) analytical aspect: appropriate reference method establishment. Unprecedented opportunities exist for innovation and process understanding. For example, particles with inherent heterogeneity (due to for example morphology difference) or strong segregation tendency (due to for example particle size difference) may call for particle engineering strategies (such as milling), novel formulation strategies, or innovative equipment/process design strategies such as continuous processing. In this presentation, case studies based on FDA research results will be presented to highlight several technical issues, such as dynamic measurement errors, sampling strategy (sample location and sample size), sampling bias, analytical verification, general linear modeling for process design space development, and scale-up effect. The effect of process variables on the dynamic measurement errors, design space, and scale-up will be discussed. Finally, a science- and risk-based approach for pharmaceutical powder blending will be discussed from a regulatory science perspective. A Century of Chemical Engineering Design Education: Batch, the Future of Process Design?